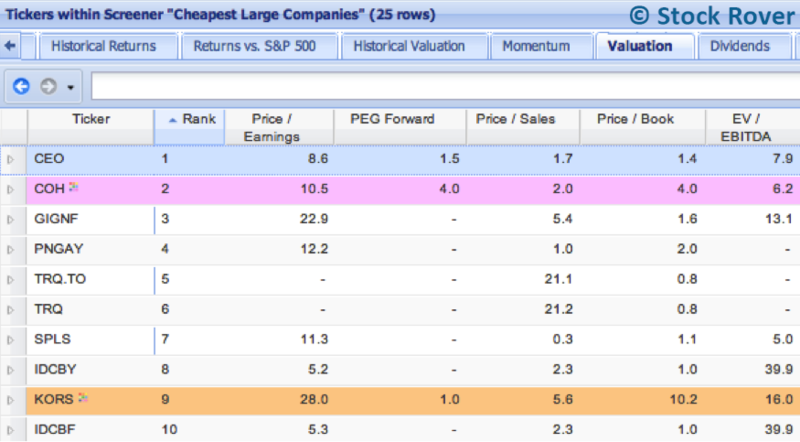 …And “Cheapest Large Companies,” which uses 5-year averages, with Price/Book, Price/Tangible Book, Price/Sales, and Price/Earnings, weighted equally, to select the 25 cheapest mid cap and large cap companies. Here, KORS peer Coach (COH) also makes the list, ranking at an impressive second place. Interestingly, COH has fallen into deep trench recently, reaching its lowest price since 2009. And while it didn’t pass either screener, I am personally a big fan of Kate Spade (KATE), a third major player in the mid-range luxury handbag game. Every time I step into one of their brightly lit stores, with its cheerful colors and quirky décor, I come across at least one item that I desperately want. There are some Michael Kors and Coach products that I like as well, but they are hardly able to instill in me the same feeling of intense longing that Kate Spade products do. So is KORS’ top-dog status according to Stock Rover’s screeners a reflection of a mainstream consumer preference that just differs from my own, or are there other factors, such as business structure, management, and financial strength that play a hand? Will long-time industry standard Coach regain its footing? And has Kate Spade made good business decisions, or just good design decisions? Curious to see how this all translates in the investing world, I decided to investigate. Earnings Growth: Who Makes the Cut? Financials: A Clean Track Record? Michael Kors, which started out as an American luxury sportswear house, aims to create a polished, effortless, sporty-chic aesthetic. CFDA Award-winning designer Michael Kors launched his namesake label in 1981 for Bergdorf Goodman. Now, it is carried in Michael Kors retail stores as well as high-end department stores and has expanded to offer accessories, including handbags and small leather goods crafted from high-quality leather and other exotic skins, footwear, swimwear, and menswear. Michael Kors’ MICHAEL line was launched in 2004 to meet growing demand for accessible luxury goods and caters to a younger demographic. It also includes accessories, footwear, and apparel and can be found in all of Michael Kors’ lifestyle stores as well as leading department stores around the world. Coach is known for its high-quality handbags and leather goods, of which the best can be described as timeless. The longest running of the three brands, it was founded in 1941 as a family-run leather goods workshop. In 1996, Reed Krakoff came on board as the new creative director to transform Coach into an international luxury empire by introducing a broad range of merchandise from luggage to shoes to outerwear splashed with the now instantly recognizable “C” pattern. Due to its waning popularity as of late, Coach is once again looking to transform itself, installing a new CEO, Victor Luis, and creative director, Stuart Vevers, earlier this year. Kate Spade New York, in following with its motto “live colorfully,” uses bright colors and whimsical motifs to liven up classic silhouettes. In 2007, creator Kate Brosnahan Spade turned her handbag company over to Kate Spade & Company, with Deborah Lloyd, former executive vice president of Gap’s Banana Republic division, as president and creative director and Craig Leavitt as CEO. Under Deborah’s wing, Kate Spade launched clothing and jewelry collections and transformed its target demographic from 40-something suburban moms to young, urban professionals between the ages of 26 and 36. With the aim of becoming a global lifestyle brand, Kate Spade has since expanded to include Jack Spade, its menswear line, Kate Spade Saturday, a casuals line offering lower price points, footwear, babywear, fragrances, home goods, and stationary. 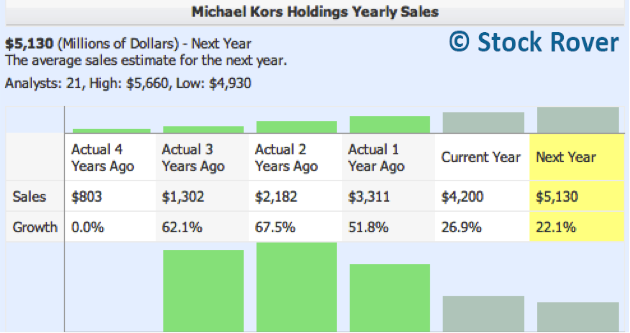 Michael Kors has had consistently strong sales growth since its IPO in 2011, as shown below. Though its growth seems to be moderating for the coming year, this is only natural as the company gets larger. Credit Suisse analysts forecast that net revenue will continue to grow up to $7 billion in the coming years, doubling from $3.3 billion. This is due in part to Michael Kors’ superior business model, with 48.7% of its profits coming from retail in FY13, 47.3% from wholesale, and 4% from licensing, which provides just the right mix to appeal to broad customer base but still profit from full-price sales. And with 80% of its sales coming from accessories, which is the fastest growing retail segment, Michael Kors is well-positioned for future growth. 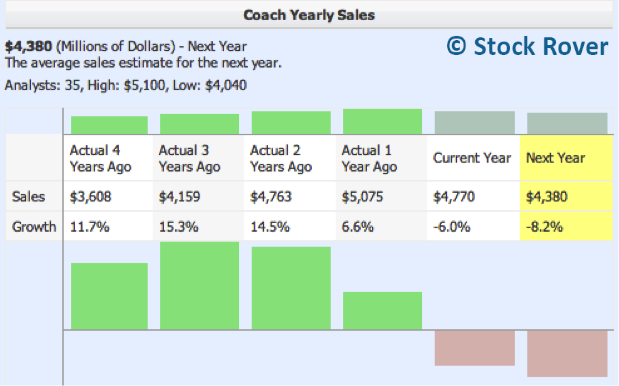 Coach, as shown in the following graph, has seen negative sales growth over the past year, and this trend is predicted to continue into 2015. Its total sales in North America, where it generates approximately 70% of its revenue, declined by 18% this year, with a 21% decrease in comparable store sales. This is mostly driven by the waning popularity of its premium handbags, which account for 58% of its sales. However, its menswear line, currently making up 11% of its sales, exhibited strong double-digit growth in the third quarter of 2013, and sales in China continued to grow at a rapid clip of 25% as well. One caveat for investors is the possibility that Coach’s unpopularity in the U.S. may spillover to China, negatively impacting future sales. 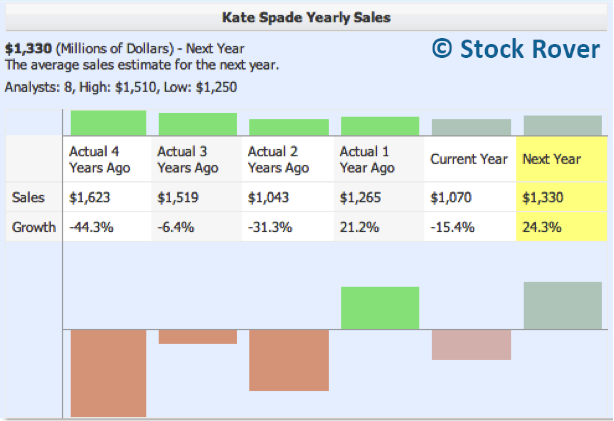 Kate Spade’s sales growth has jumped around dramatically over the past few years, as evident in the following graph. This is due to its frequent brand restructuring and divestiture of underperforming businesses (explained below), but it is expected to grow at a promising rate of 24.3% next year, surpassing that of Michael Kors. Regarding the KATE brand restructuring, here’s a bit of history on KATE and its ticker: In May 2012, Liz Claiborne Inc. renamed itself Fifth and Pacific, Inc. and changed its ticker on the NYSE from (LIZ) to (FNP), reflecting its shift in focus to just three brands – Juicy Couture, Lucky Brands, and Kate Spade. In January this year, the company once again changed its name to Kate Spade & Co. (KATE), reflecting the divestiture of its Juicy Couture and Lucky brands, which were hindering its growth. It is currently streamlining its business to focus primarily on its strongest performing brand, now its namesake, and so far, the results have been favorable. Net sales from KATE’s Kate Spade segment alone grew 54.1% in the first quarter of 2014, and its total net sales increased by 33.5%. Thus, the company’s expected growth seems to indicate that it is finally pulling out of its temperamental period rather than experiencing just another wild swing. EPS growth is another way to measure the future profitability of these companies. 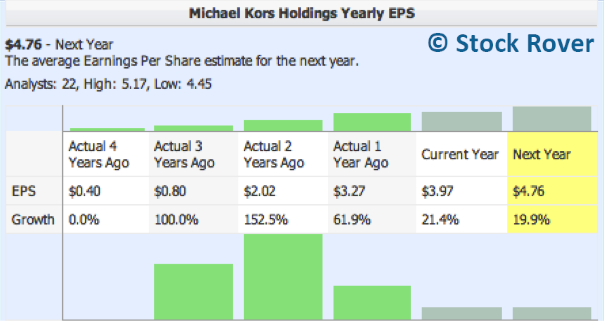 KORS’ yearly EPS growth, shown above, appears to be moderating from extremely high levels according to the chart above, which is normal and anticipated. However, it is still predicted to grow at a rapid clip of 19.9% next year. 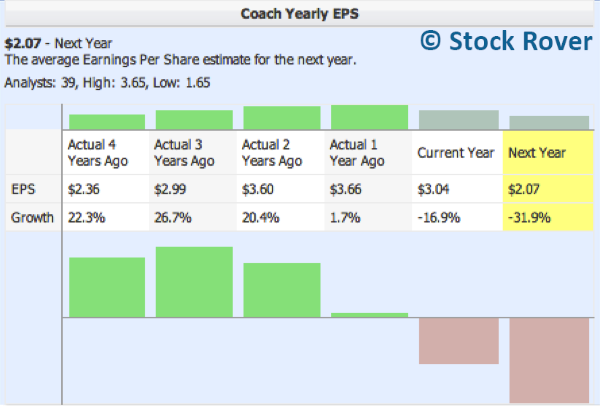 Coach’s EPS (above), on the other hand, is expected to fall by a hefty 31.2%, which is obviously a major concern for investors. KATE’s recent restructuring has resulted in a major recovery in earnings, with a massive 176% expected growth rate this year in contrast to its 58.3% decrease last year. Once again, KORS (above) proves to be a strong player. It is making consistently high returns across all three metrics, with a general trend of growth, suggesting that it is making efficient use of its capital to generate earnings. While Coach (above) is also displaying efficient use of its assets and invested capital, it is worrisome that these numbers have been on the downslide since 2012. The story is a little harder to pin down with KATE, since its ROE, ROA, and ROIC have fluctuated significantly in the past but have started to increase this year due to its divestitures of underperformers. In particular, its current ROE appears to be a whopping 258.4%, but this is the result of its very low equity. Since a company’s stock price is a reflection of both its actual performance and investor sentiment, I decided to generate some price charts next to help visualize how KORS, COH, and KATE have been measuring up lately. First, I charted the price change for each company over the past year. Here, we see that KORS (pink line) and KATE (blue) have followed a similar trend, though KATE’s growth has been jumping upward this month while KORS’ has taken a dip. COH’s price (orange) has been gradually declining, with sharp dips in early May and mid-June that correlate to its 1Q report and investor’s day announcement. Overall, KATE is the clear winner with a 75.5% increase in price, and COH is the clear loser, with a 38.4% price decrease that exposes its unpopularity with customers and investors alike. It might look like the x-axis, but that orange line above is actually COH compared with its peers, which gives you an idea of just how far behind it is. Notably, KORS and KATE have moved pretty similarly relative to COH, but recently their paths have diverged, with KATE gaining the edge. Finally, I wanted to see how these stocks compare to other benchmarks, so I created a table of their one-year price returns versus their sector, industry, and the S&P 500. This data confirms what the price charts and growth stats reveal: KORS and KATE are outperforming in each category by a wide margin while COH once again moves in the opposite direction. So clearly, Coach is far at the back of the pack and has its work cut out for it before it can even truly compete. While KATE seems to be a rising star, its flaky performance in the past may give pause to those who are betting on it. This pegs KORS as the safest pick thus far, though it has not moved as fast as KATE in the past year. This is where the plot starts to thicken. Let’s break it down by company. Coach is actually looking quite favorable in terms of valuation – it has the lowest Price/Earnings, Price/Cash Flow, Price/Sales, and Price/Book values as well as the highest cash flow yield. It is also the only stock of the three that pays out dividends, with a payout ratio of 40.7% of earnings, which is higher than that of most other companies in the luxury goods subsector. In fact, CEO Victor Luis, during Coach’s annual investors day, promised investors that Coach would maintain dividend yields and aim to return more cash to shareholders. Thus, Coach’s valuation suggests that, though its price is undergoing intense downward pressure and its sales are decreasing, management is still confident in the company’s ability to generate strong earnings going forward. As expected, KORS’ valuation metrics look more expensive in comparison to Coach’s, with the highest Price/Sales value, but it also has the lowest PEG forward, implying that its future growth and profitability will justify its hefty price tag. Considering both COH and KORS turned up in the Cheapest Large Companies screener, it is not surprising to me that both seem to have fair or inexpensive valuations. 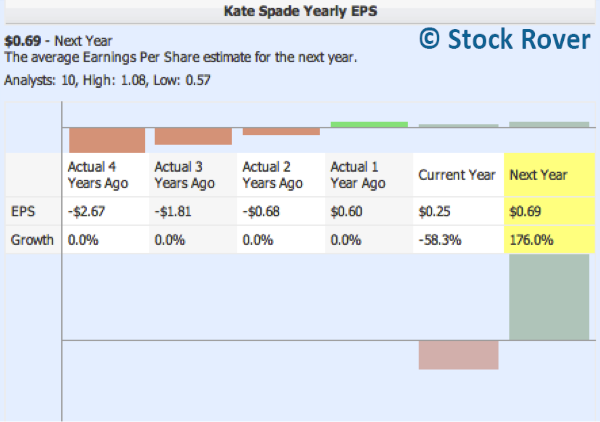 KATE, meanwhile, has an astronomical P/E ratio of 83.3, which is based on its poor recent earnings. The poor earnings are also reflected by its negative cash flow yield and missing P/CF, which cannot be calculated if the cash flow value is negative. KATE’s P/S at least provides some consolation to investors, at a value between that of COH and KORS. Seeking an explanation for these complex narratives, I decided to turn my eye to each company’s income statement and balance sheet. Since it went public, KORS has been making steady profits. Its sales have grown especially rapidly, and it is performing well across the board. Its balance sheet also looks impeccable, with no debt and increasing cash. In addition, its increasing cap ex, intangibles, and NetPPE show that it is investing money into expansion. Just looking at its current year (top row above), Coach has a very strong income statement, with healthy margins and the highest net income of the three companies. However, across all metrics, its numbers have been decreasing over the past 10 years as a result of its decreasing sales volumes. In its 2014 1Q report, Coach attributes this decrease to declining comparable store sales due to decreased store traffic as well as the elimination of third party internet events and limited access to its e-factory flash sales. Nevertheless, Coach’s financial strength gives it leverage in repositioning its brand image and making the most of any opportunities to turn its sales around. 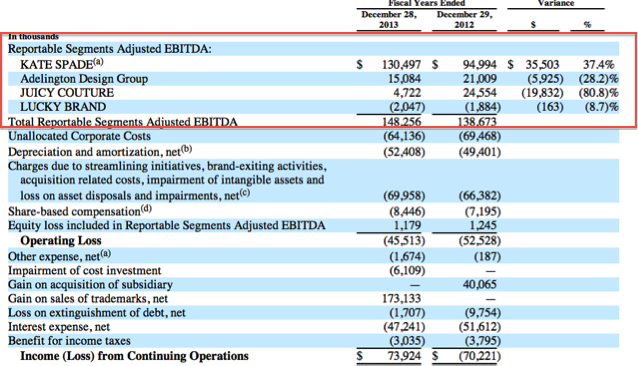 Coach’s balance sheet shows that its cash is decreasing, though it still has significant cash on hand. It is putting a significant portion of its cash to work via capital investment in new store openings at home and abroad and in its recent hire of Stuart Vevers as the new Creative Director (more on him later). The high dividends it pays out to its investors also consumes a lot of cash. In recent years, KATE has certainly been growing its sales and net income, as reflected by its net and gross margins. However, it is clear from its negative operating income and low EBITDA margin (the basis for most valuation metrics) that the less profitable names that were formerly part of its portfolio, Liz Claiborne, Juicy Couture, Lucky Brands, and Mexx, have hindered its progress. KATE’s 2013 10K, published before its divestiture of Juicy and Lucky, confirms that Kate Spade was the company’s only reportable segment that was growing its earnings. Now that KATE has shed the dead weight and is focusing its business exclusively on Kate Spade, it should see improving operating and gross margins in the coming years. KATE’s balance sheet (below) shows that it has a greater amount of long term debt than cash, which comes from both its unprofitable continuing operations and the “expenses incurred in connection with the Company’s streamlining initiatives, brand-exiting activities, acquisition related costs, losses on extinguishment of debt and loss on sales of trademarks” (Kate Spade 2014 10Q). These efforts also explain its lower Intangibles and Net PPE in 2013, though they have increased in 2014, given Kate Spade’s recent growth initiatives. KATE is also making efforts to reduce its costs through such measures such as tightening control of discretionary spending, outsourcing certain corporate functions, and engaging more extensively in direct shipping. In the long term, it believes that its streamlining efforts will greatly increase savings and cut down costs. (2013 10K). The final trial before a victor can be crowned, of course, is how each company expects to grow in the long term. In the fashion industry, consumer tastes play heavily into a stock’s success. Thus, investors should know, in the case of KORS and KATE, whether or not the companies have the ability to sustain and grow their profits, and in the case of COH, whether its new management can woo customers back, this time for the long run. As of right now, Michael Kors shows no sign of slowing down. It has a seven-part corporate strategy that lays out its plans for continued expansion in North America as well as Europe and Asia. It also plans to invest in its men’s business, which it sees as a potential $1 billion market, and strengthen its global e-commerce business. One interesting strategy it is pursuing is the conversion of department store doors into branded “shop-in-shops,” which are basically miniature stores staffed by Kors employees, as Kors has found that sales typically triple with the installation of such a shop. Of course, like any other brand, Michael Kors still faces the risk of falling out of favor with consumers. However, Mr. Kors’ talent for understanding precisely what his customers want has resulted in consistently fashionable and functional designs over the years. Despite its gloomy outlook for the upcoming year, CEO Victor Luis urges investors to focus on the brand’s long-term prospects. I feel like they are moving in the right direction by taking Stuart Vevers on board as creative director. Vevers has an impressive resume, which includes past stints as the creative director of Loewe and Mulberry, and has a talent for working with leather goods that snagged him the British Fashion Council’s Accessory Designer of the Year award in 2006. His vision for the new Coach can be seen in his launch of the brand’s first 2014 autumn/winter ready-to-wear collection, in which he makes a clean break from the past by, essentially, invoking it. Taking inspiration from modern New York street style and Coach’s classic American heritage, his line undoubtedly aims to appeal to a younger, trendier, urban audience. If you’re a fashion enthusiast like me, the Telegraph’s Fashion column has a more in-depth review you might be interested in. Though reviewers (and myself) are raving about Vevers’ first collection, my concern is that Coach’s repositioning might alienate older customers, some who are very loyal to the brand. But if it can manage to provide a good assortment of classic handbags and more fashion-forward pieces, I can see its plan succeeding. While fashion itself is always a risky bet, Coach has some other enticing growth prospects. It is continuing the expansion of its business in China, where a growing middle class means a growing demand for accessible luxury goods. In this aspect, Coach is notable for its creativity and attention to detail, recruiting staff for its Chinese stores from top universities and adding demographic-relevant touches to its products such as shoulder straps on handbags and expanded wallet pockets. It is also growing its menswear and footwear lines, which have seen positive sales while handbag sales have floundered. In particular, it aims to open new standalone and dual gender stores with a greater selection of men’s products. While Coach’s next few years look quite grim, I feel that given its management changes, forward-looking strategies, and strong financial position, it has the potential to make a long-term turnaround. Though Kate Spade is currently seeing the fastest growth, the important question is whether it is just a passing trend or has the potential to grow into the lifestyle empire it seeks to be. Since I personally like its products a lot, and I know my friends do as well, I am rooting for the latter. Moreover, Kate Spade’s performance in the past, according to its income statements, has been strong, so I believe that Kate Spade & Co. has taken the right path in streamlining the company. In terms of U.S. growth, Kate Spade is looking to grow its Jack Spade line, further establish its Kate Spade Saturday line – which, with lower price points, gives it an opportunity to reach new customers, and convert existing Juicy Couture locations into Kate Spade outlets. If Deborah Lloyd’s Asia-inspired 2014 fall ready-to-wear collection is any indication, Kate Spade, like the other contenders, is also aiming to expand its presence in Asia. It already has a strong position in Japan, experiencing 20 percent year-to-year growth, and a meaningful presence in China. In addition, it is planning to open new retail locations in Brazil, the UK, and Southeast Asia. Finally, Kate Spade is further developing its e-commerce business, which is already driving strong gains from direct-to-customer sails. Its innovation in this area is impressive, with omni-channel tie-ins across the Kate Spade family, a social media loyalty program, and “Fit Ratings” on its Saturday website that allow customers to share publicly whether or not an article of clothing compliments different body shapes. As the smallest business of the three, Kate Spade still has substantial room to grow, and based on its prospects and performance thus far, I believe that it will. After evaluating each stock, I feel that all of them have long-term potential, especially given the strength of the accessories industry as a whole. Just like shoppers, investors have different tastes, so while KATE may appeal to momentum investors, COH may catch the eye of those who like to seek out turnaround situations. Due to its top-notch performance in each category, KORS has the overall champion title in the bag (yes, pun intended). But in my opinion, COH and KATE are promising picks as well.